The morning arrived quickly today. I grabbed for my copy of Oswald. a morning date at Panera. We ran a couple of errands and came home. I checked my emails and answered a few. this winter that feel more frozen than fluid. a seat on the couch. Slowly God whispers familiar words to me. I need to not quickly rush past familiar words. 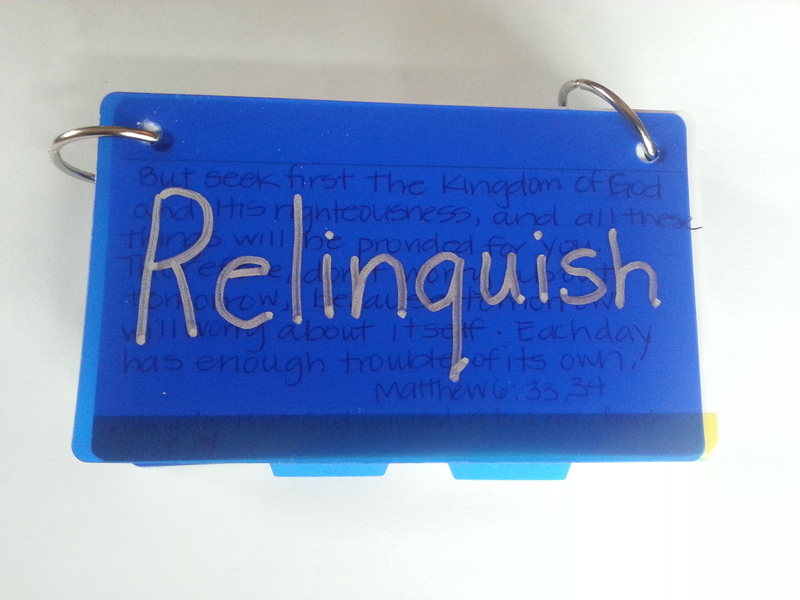 relinquish all the other stuff. Because that other stuff is already dealt with in preceding verses. I relinquish tomorrow in favor of today. I will let tomorrow worry alone and without my help. I will remember God’s familiar words to me. It’s a little place where I actively replace my wordiness with His incomparable Word. I will run after His words even if it takes me until nearly lunch time to find them. Ahhh, the mere thought of having scribed his words in full. May we allow His words to be inscribed upon our hearts and minds. That truly would be the fullness of joy. Beautiful in person and pinning, thank you Helen. I keep a scripture journal for those times of reading and study when a verse speaks to my soul. Perhaps someday it will be filled with every verse of His Word.